Do you believe in life-long learning? I do - but it is difficult to get children to understand what it means. So this card is dedicated to the whole philosophy that we continue to learn new things all our lives. I have used my favourite saying and there is a hidden message there. Can you see it? 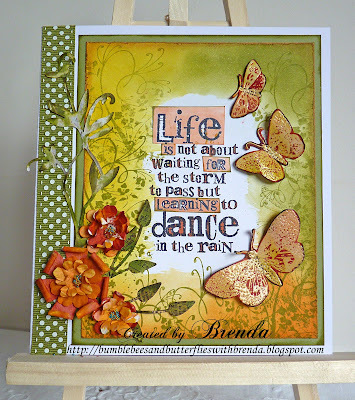 This piece is for Lisa's 'Anything Goes - with Summer Colours' challenge over at the Stamp Man. Do pop over and take a look at the most fabulous inspiration from my very talented teamies. 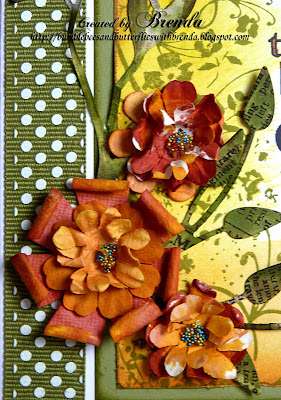 My inspiration for this card came from Joanne Wardle's article in the August Craft Stamper magazine for using resist techniques, but I didn't keep mine to a one layer card - of course I went on to embellish it more. 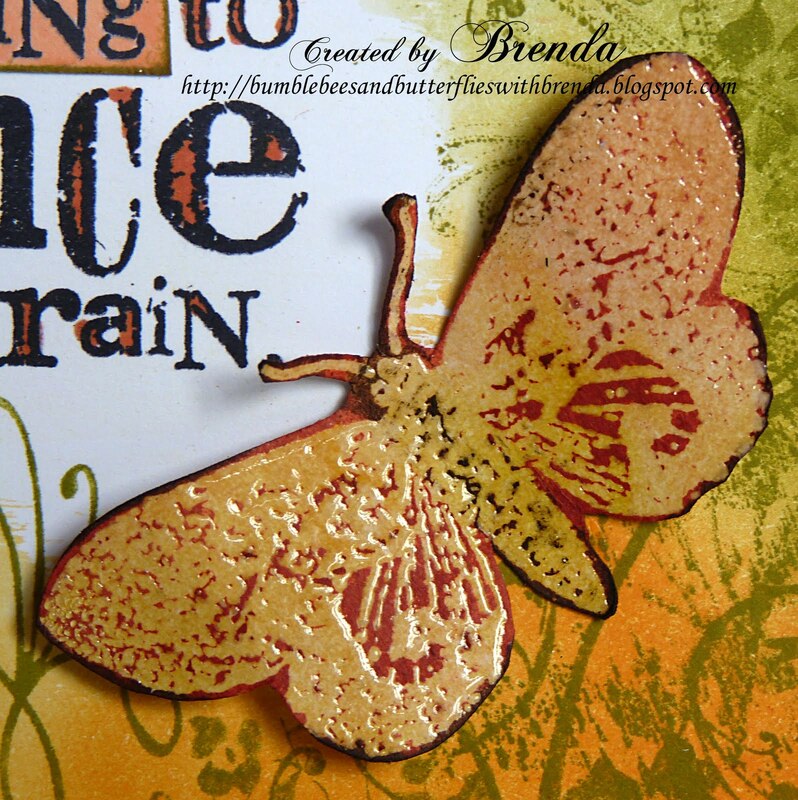 I used art masking fluid as the resist for the centre sentiment to be stamped onto. The flowers were made very simply with pre-cut, bought white paper flowers, swooshed in distress inks, heat dried - being scrumpled and curled in all the right places, and then beadazzles added to the centres. I thought they looked very summery, just like a patch of marigolds. 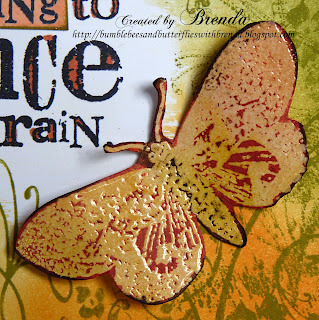 The butterflies were stamped with embossing ink onto card I had distressed with DIs, cut out and then DSs swooshed all over them. The depth of colours really soaked into all those tiny cracks and crevices. DIs - peeled paint, mustard seed, spiced marmalade. DSs - peeled paint, forest moss, wild honey, fired brick, walnut stain. Dies - marianne and crealies. Promarkers (just the lettering on the sentiment). I hope we will see you over at the Stamp Man for our summer colours challenge and don't forget that Jill generously provides a £10.00 voucher for every challenge to spend in her on-line shop - so that's gotta be worth entering for. I hope you are having a good summer (or winter if you are in the southern hemisphere) and that you are having some good crafty time for yourself (especially if you have children who are off school for the summer holidays). Lovely card Brends...beautiful colours, nice and sunny! 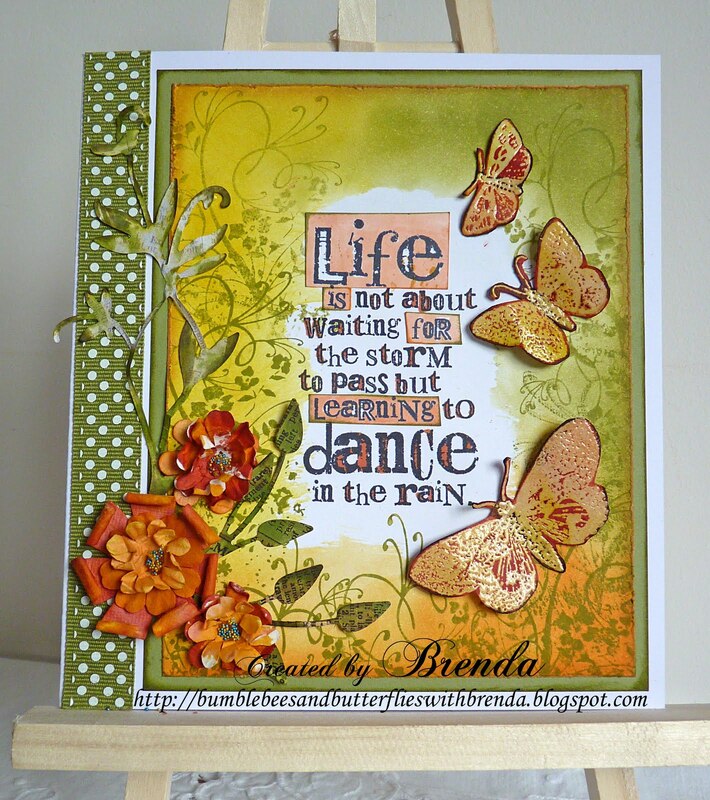 Love your summery card, Brena...beautiful text and the hidden message is even more beautiful...lovely flowers and butterfly...hope you have a wonderful weekend! Love that sentiment and very clever how you highlighted the hidden message! This is a lovely card and the flowers, flourish and butterflies really pop! Just so beautiful! Have a lovely Friday! Love your flutterbyes and flowers Brenda - as always! Oh, that's a wonderful piece, great summerfeeling. Love what you've done with the quote. Brenda this is stunning!! I absolutely love it!! Brenda - absolutely stunning. Love the colours and the fabby flowers. I totally agree with your first paragraph - having worked in employee development for a long time it was something that was constantly at the forefront. It was something I also treid to pass on to my kids and certainly one got it - and even now he sets himself a major goal each year. Just had to drop in on this creation as well to say another stunner. This is such a beautiful tag!